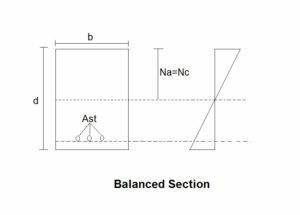 The section in which the quantity of steel is just sufficiently provided that the concrete in compression zone and steel in tension zone reaches to their permissible stresses simultaneously is called balanced section. In this section, the quantity of steel is not adequate to make the extreme concrete fibers in the compression area to get compressed to their highest permissible stress. In this section, the quantity of steel is not adequate to make the concrete to get compressed in compression area to their highest permissible value. That means the steel is provided less than that a balanced section is required. In under reinforced section, the depth of actual Na is less than the critical Na. 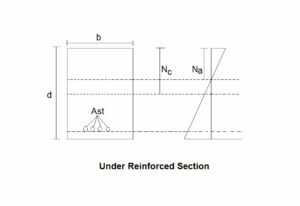 In this section, the quantity of steel in tension zone is greater than the quantity of steel required to make compressive zone concrete to get compressed to their most extreme admissible value. In other words, when the extreme compressive stress in concrete achieves its allowable limit, the comparing tensile stress in steel will be not as much as its permissible value. 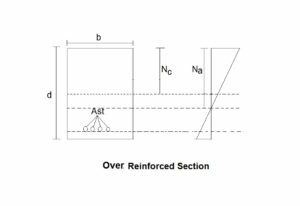 So in overreinforced section, the depth of actual Na is greater than the critical Na.